Who hasn’t heard a contractor horror story? The fact is, you can drastically increase your odds of finding a quality construction professional in Chicago by following a few simple steps. Before seeking a contractor, first understand the type of person you need. Many problems arise because homeowners do not understand the different roles in construction. A specialty contractor or tradesman, such as an electrician, carpenter, or mason is expected to have expert knowledge in a particular field. This generally takes many years to acquire. An electrician is not expected to understand how to patch drywall, even though he may need to open drywall to complete wiring. A carpenter usually does not know how to repair brick, even though brickwork might be required to install a window. The gaps between trades, and general coordination is handled by a general contractor. A general contractor coordinates different tradesmen and is responsible for producing a finished result. In an attempt to save money, many homeowners try to be their own general contractor. On small and simple projects that involve only one trade, or where a homeowner has a good understanding of proper coordination and sequencing of construction, this can work, but it also has the potential to lead to frustration, rework, and additional cost. Likewise, on small remodeling projects, GCs, which often come from the ranks of carpenters, try to perform all of the work of the different trades themselves, in an attempt to keep the contract price down and get the job. Not only can this violate building permits, which often require some of the work to be done by licensed trades, such as electrical and plumbing work, it can also lead to quality problems, as no one person can be expected to have deep knowledge in multiple trades. The more information you have, the better your odds of finding a qualified professional. Here are some steps to take to drastically improve your odds. Unlike many states, Illinois does not license general contractors or carpenters. 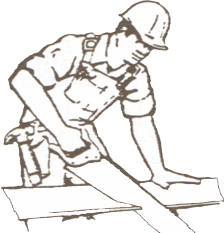 There is no test or qualification required to call yourself a general contractor or carpenter in Illinois. However many municipalities, such as Chicago, do require licensing. This provides some oversight, and requires insurance. If a contractor is operating in Chicago without a license, they are violating the law. This should be considered a warning sign for potential customers. In Chicago, two licenses are required: 1. Home Repair (Dept. of Revenue) and 2. General Contractor (Dept. of Buildings). You can find the list of licensed general contractors for many municipalities online, although they may not be completely up to date. Other specialty trades, such as Plumber, Mason, Electrician are licensed through the State and municipality. Nearly all work involving these trades requires a building permit. When you apply for a building permit involving these trades, you must list the license numbers for these trades on the permit application, and they will be checked for good standing. The helps ensure that you have qualified professionals working on your project. The EPA now requires all contractors (including specialty trades) working on homes built before 1978 to be trained and licensed in lead-safe work practices. Always check with the city whether a building permit is required before you start work. Permits are the responsibility of the owner, although they may delegate others to actually get them. Doing work without required permits puts the owner at great risk. Many contractors will tell the owner a permit is not required, when in fact it is. Ask for the contractor’s insurance agent, speak to the agent directly, and have them send you a copy of the contractor’s insurance certificate, with you named as certificateholder, with a 30 day notice of cancellation. All employers in Illinois are required to carry workers comp insurance on their employees. This insurance pays for injuries, rehabilitation, and disability. If a worker is injured on your property, and the employee is not covered by workers comp, you will likely be sued and asked to cover the cost of that employee’s care and/or rehabilitation, regardless of whether you were personally responsible. Even simple accidents can result in massive expenses. Many unscrupulous contractors try to evade workers comp insurance by classifying their employees as “subcontractors”, even though they are really employees. This never holds up when an injury occurs and an investigation is done. As an owner, you are responsible for knowing who is working on your property and verifying insurance coverage. Otherwise, you could be held responsible. If a contractor is violating the law, do you think they are worthy of your trust in other areas? Illinois law allows officers or owners of a company to exempt themselves from workers comp. However, the owner should then be covered by a medical policy that covers them for job-related injuries. (Many medical policies exclude job-related injuries, as these are assumed to be paid for by workers comp). Employees are never exempt from workers comp. If you are a member, you can check feedback on contractors, or leave your own. Be aware that until recently, information about contractors, such as whether they were licensed and insured, was never verified, and today is only spot checked. So regardless of what Angie’s List says about a contractor, you still need to check licensing and insurance yourself. Also be aware that much of the feedback on Angie’s List is from a customer service perspective, rather than a technical competence perspective. Many homeowners have trouble determining the technical quality of the work, yet this is vitally important. If a contractor has great customer service, but his work doesn’t hold up over time, high ratings may not be justified. or a combination of the above. Any of these scenarios can spell disaster. Rather than shopping for the lowest price, spend extra time and use the steps outlined above to find someone who is qualified, and who you feel you can communicate with. Chances are they will be giving you a good price anyway, and more than likely will represent the best value. You may have heard mention of bonding. Bonding is used extensively on commercial projects. There are many different types of bonds, including bid bonds, license bonds, performance bonds, and wage and benefit bonds. Most small residential projects do not involve bonding, although some municipalities require bonds to be posted in order for the contractor to obtain a license. These serve mostly to protect the municipality. There is no reason a homeowner couldn’t require a bond to be posted, but unless a homeowner has familiarity with the process, they will require legal help to put this in place properly. The contractor will also have to increase their price accordingly to cover the cost of the bond. Additionally, depending on the asset level and credit rating of the contractor, not all contractors are bondable. Simple and inexpensive EPA-approved test kits used by an EPA-Certified Renovator can determine whether lead is present on areas being considered for repair or renovation. Much of the older woodwork in Chicago was originally varnished. Varnish may or may not contain lead. If the woodwork was first painted after 1978, or even earlier, since lead was being phased out long before 1978, you may not have any lead paint present on the interior. Your contractor should be familiar with all of this. If he is not, consider whether he is the right person for your job. If he cannot produce an EPA license, he is operating outside the law.